Personal. Professional. Product. Political. I'll Get Your Brand Up. If you've been following along for the past few days then you've seen my pencils & my inks on the "Tax Max" character. From what I understand, Tax Max will be appearing in an auto dealership commercial. He was described to me as your typical, larger-than-life super-hero type with a big 'ol, proud, cheesy grin. 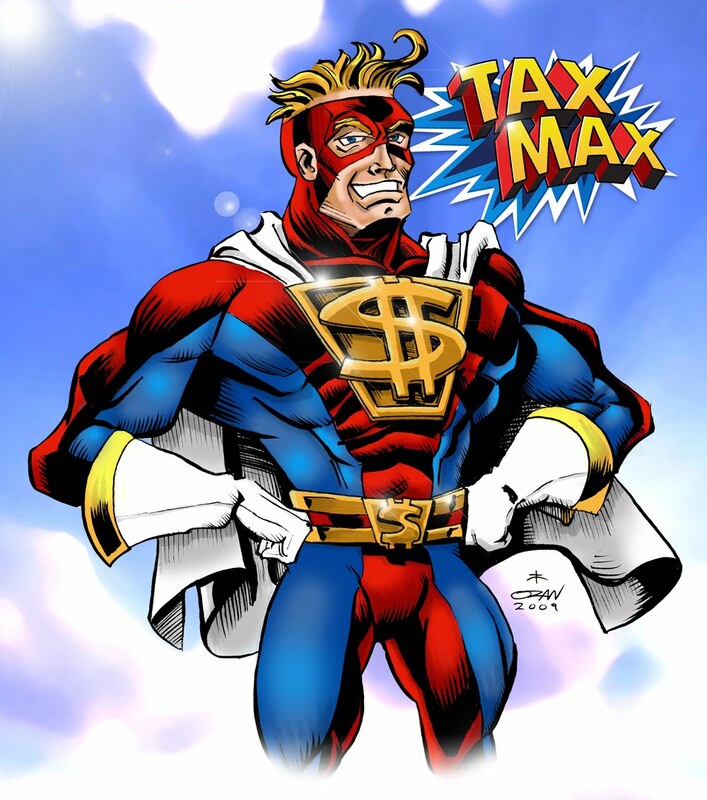 I didn't get instructions on the Tax Max uniform except to make it red, yellow & blue (hmmm...I wonder why?). I recommended that we simply use a dollar sign for his emblem since it resembles an "S" because the whole point is that Tax Max will "saaaaave yooooou money!" Drawing this one wasn't going to be enough, though. I needed to add digital color and set the character as a nice movable element in Photoshop that could be used in After Effects. I had to color the piece with a mouse (we don't have a pen tablet at our office and this is on a real tight deadline). I also had to add more cheese to it with a real simple, comic-book style "Tax Max" title. I'm not sure how the finished spot will look (I'll post it once it's all put together so you can see what this will be used for), but either way...here's where Tax Max stands as he goes to video. Thanks for coming along for the ride. Contents of this site © Oran Parker. Travel theme. Theme images by Terraxplorer. Powered by Blogger.